Boeing employees across Washington state will receive bonuses totaling nearly $600 million in the coming weeks, the largest annual bonus payout in company history. The total includes payouts to white-collar employees, Machinists on the factory floor and managers, but not executives. Boeing’s nearly 66,000 current employees in the state will be eligible for the bonuses. More than 6,000 more who worked at least part of last year before leaving the company will get a partial bonus, prorated according to how long they worked last year. A year ago, based on 2016 performance, white-collar employees in the state received a total of $170 million, while Machinists were paid a total of $63 million in bonuses. The figure for managers was not separately released. The larger bonuses this year are a result of a blockbuster 2017, when Boeing made a profit of $8.2 billion, up from $4.9 billion a year earlier, and employees delivered a record number of commercial airplanes and reached new productivity highs. Spencer Cohen, senior economist with Seattle-based economic development consulting firm CAI, said past studies show most of the $600 million will be spent locally and will benefit many different businesses where the Boeing workers live. A 2013 CAI study of the aerospace industry in the state suggests that the extra wages generated in those businesses magnifies the impact, so that in total about an additional $1 billion of income will be injected into the state economy. In 2016, total wages in the state amounted to about $200 billion, Cohen said. Unlike previous years, Boeing did not break down the total of bonuses paid out by business unit, nor did it provide similar data on bonuses for employees in other states or company-wide. Members of Boeing’s engineering union, the Society of Professional Engineering Employees in Aerospace (SPEEA), will receive a bonus equal to 18.7 days of extra pay, or 7.2 percent of their annual salary including overtime pay, roughly double what they received last year, according to SPEEA spokesman Bill Dugovich. Boeing’s white-collar bonuses are based on a weighted average formula that measures the company’s financial performance against a preset target for three metrics: revenue (25 percent), core earnings per share (25 percent) and free cash flow (50 percent). In this calculation, Boeing removed the impact of the boost to earnings from the big cut in corporate taxes passed in December. Still, the 2017 financial performance came in 87 percent above the set target. SPEEA data shows that the average annual salary for a Boeing engineer, without overtime, is $132,000, which would provide a bonus of $9,500. The data shows the average annual salary for a Boeing technical staffer, without overtime, is about $100,000, which would provide a bonus of $7,200. 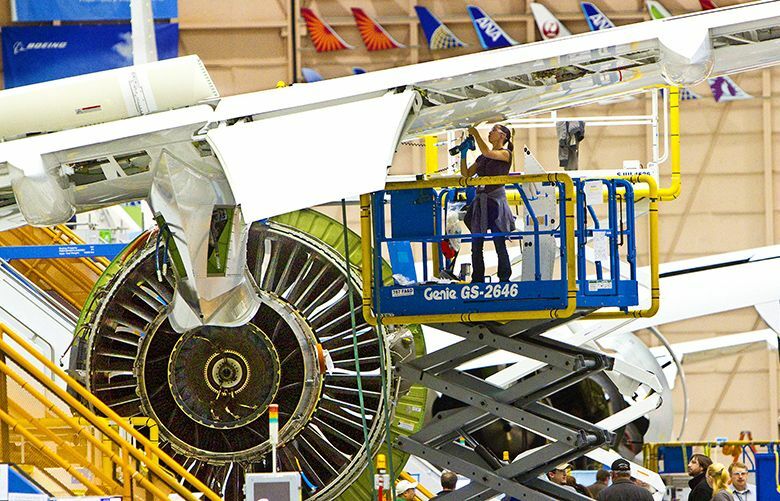 In addition, Boeing and the union mutually agreed to adjust upward the 2018 salary increases for engineers beyond what the SPEEA contract requires, so that they get a bigger raise rather than a one-off lump sum. “Boeing recognized the need to go above and beyond contract requirements for salary pools to retain expertise and experience in the workforce,” the union said. Based solely on the market comparison required in the SPEEA contract, the 5 percent pool of money for salary increases for engineers would have funded an overall 1 percent raise with a 4 percent lump sum. Instead, Boeing is providing an overall 3.2 percent raise with an additional 1.8 percent lump sum for all SPEEA engineers. “That’s how we attract and retain the best talent,” he said. Members of the International Association of Machinists (IAM) union at Boeing have a separate incentive plan that’s based on metrics assessing quality, productivity and safety. Based on their performance, Machinists will receive a bonus equal to 5.5 percent of their annual earnings last year including overtime, just shy of the 6 percent maximum payout allowed under the IAM contract. That’s more than double last year’s bonus, which was 2.6 percent of annual earnings. The union did not provide average salary data. Machinists will receive their bonuses in their Feb. 15 paychecks. Nonmanagement white-collar employees, union and nonunion, will get their bonuses Feb. 22. Boeing managers will receive their bonuses March 9. Information in this article, originally published Feb. 6, 2018, was corrected later the same morning. A previous version of this story incorrectly stated that the size of the white-collar bonus is based on a metric called “economic profit.” Boeing used this metric until last year, but this year changed to another formula based on revenue, profits and cash flow.